Whiteoak’s Nate Frazer attempts a shot in the closing moments of the Wildcats SHAC matchup against the West Union Dragons. MOWRYSTOWN – The Whiteoak Wildcats hosted the West Union Dragons on Friday in a Southern Hills Athletic Conference boys varsity basketball matchup and honored their seniors Chase Butler, Jacob Campbell, Atlee Carr, Logan Cummings, Nate Frazer, Traeten Hamilton, Zach Rand and James Taylor prior to tipoff. The Dragons were able to come out on top and headed back to Adams County with a 52-47 road conference victory. The highlight of the game came in the fourth quarter when Nate Frazer checked in for the Wildcats and scored the final two points of the game to make it 52-47. The Dragons and Wildcats made it a battle early in the first quarter with the Dragons pulling ahead by three early before the Wildcats battled back to tie the game at seven on a three pointer by Brad Asbaugh with five minuted to go in the first frame. The Dragons pushed it back to three points with the scoreboard reading 10-7 in favor of the visitors before Whiteoak senior Zach Rand hit a three to knot the game at 10 with under four minutes to play in the first. From there the Dragons outscored the Wildcats six to two and took a 16-12 lead after one quarter of play. Deavin Cumberland and Brayden Yeager hit back to back buckets early in the second frame to kot the game at 16. A basket by the Dragons gave the visitors a brief lead before Asbaugh hit his second three pointer of the night to give the Wildcats the edge at 19-18. Whiteoak pushed the lead to three points on two separate occasions with layups by Cumberland before the Dragons tied it a 23 with a three pointer of their own. West Union was able to take momentum back with consecutive buckets in the closing minutes of the half before Yeager hit a jump hook at the buzzer to make it 29-28 in favor of the Dragons at the half. 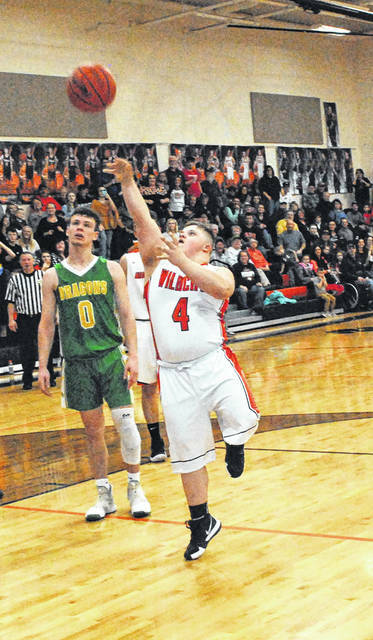 The Wildcats carried the momentum through halftime and picked up where they left off when Hunter Ruckle hit a three pointer to open the third quarter and Yeager hit another hook shot to put Whiteoak up 33-29 early in the second half. Whiteoak was able to maintian control for much of the third quarter and led 36-33 late but the Dragons finished the quarter with eight straight points and took a 41-36 lead into the fourth quarter. Whiteoak got to within three points at 46-43 with under three minutes to go in the game but, the Dragons were able to hit their free throws down the stretch to secure the victory.